Transfered from Hove Museum 3 April 1956. 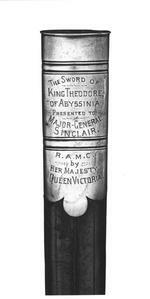 F. Wilkinson, 'A royal sword? ', Royal Armouriesd Yearbook, 4, 199, pp. 80-85, incl. fig. 2 (sword and scabbard, overall), figs 3, 4 & 5 (dets resp. of maker's name, blade and inscription on scabbard locket). - CONTENTS OF ARTICLE TO BE EXTRACTED IN NOTES.